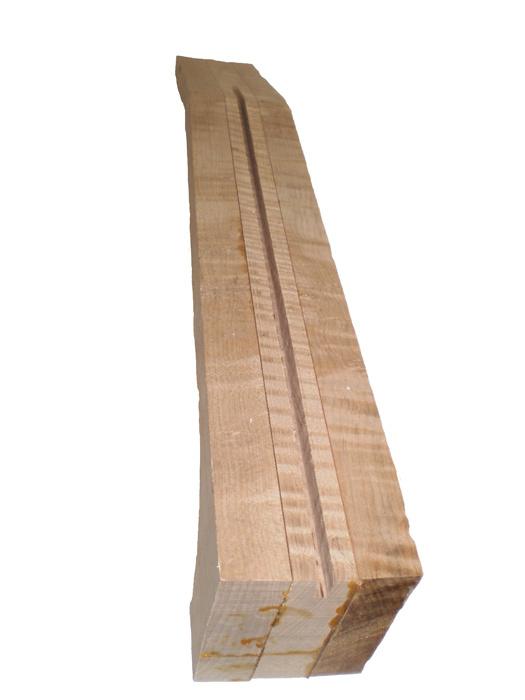 A 3 piece neck blank with a channel cut for reinforcement. Banjo neck reinforcement makes long-term stability and playability much more likely. There are different ways to reinforce a banjo neck. I use 1/8″ thick by 1/2″ wide hot rolled steel bar stock to reinforce my necks. It can be found at most hardware stores. Some builders prefer to use truss rods. Truss rods may offer some advantage because they can be adjusted, thereby changing the relief (intentional bow) of the neck. However, truss rods may also leave some air space inside the neck that may have a negative effect on the over all tone and responsiveness of the banjo. The steel bar stock leaves no empty space inside the neck and may produce a more resonant instrument. Having never made a banjo with a truss rod I won’t go into that. Today there is also the option of using carbon fiber instead of steel. Carbon fiber is very light, rigid, and strong. A channel will be cut into the neck to accommodate the reinforcement bar. I use the table saw to cut the channel. It usually takes two passes, just a little apart from each other. The channel must be deep enough that the reinforcement bar will sit flush with the jointed surface of the neck. This leaves only 1/4″ to 1/2″ of wood between the reinforcement bar and the back of the neck, some of that material will be carved away. Be very careful not to saw too deep. This job may also be accomplished with a router. The channel in the neck runs the length of it. If you are using a plunge router you may be able to cut a channel that does not need tabs to fill in the ends. If you like you might do a test run on a piece of scrap. I center the channel as much as possible. In the next photo it can be seen that the ends of the steel bar are cut out for tabs that hold it in place while gluing. This is a process that Mac picked up from Kyle Creed. The bar is set into the neck using epoxy. I cut the steel about an inch or so shorter than the length of the fingerboard. A hack saw does the job okay, but it will go a lot easier with a jig saw that has a metal-cutting blade. A ledge may be cut in the ends of the reinforcement bar so that wooden tabs may be fashioned to cinch the steel into place when gluing. The tabs are wider than the steel. When inserted into the channel they sit above the surface of the fingerboard plane. I have done the job without tabs using small pieces of waste steel to hold the bar in place while clamping. Both procedures work well. Test the fit of the steel. It should be snug but not tight. If it is too tight then go back to the table saw and remove a tiny bit more wood from inside the channel. Be sure that the top edge of the bar does not sit above the level of the fingerboard gluing surface. It should not stick up at all. It should not sit down in the channel too much either. Mix the epoxy and put some in the channel. The channel need not be full of epoxy because the bar will take up most of the space in there. Be sure to use enough epoxy to get a little “squeeze out”. Put in the bar and push it into place with the tabs or with your fingers. Clamp the tabs and use scrap steel as cauls to get clamping pressure on the bar in the middle of the neck. Avoid marring the fingerboard gluing surface with the clamps. Wipe away any epoxy that has squeezed out as quickly as possible. There may be a little left on there that will have to be scraped off or chiseled away later. That’s okay. Let the epoxy set until cured. High quality epoxy may take longer to cure. Then, remove the clamps. Carefully knock off the caul steel if it is stuck on there. Remove any extra epoxy while it is soft with a scraper or a chisel. Give the epoxy time to fully set, then trim off the protruding wooden tabs with a chisel.